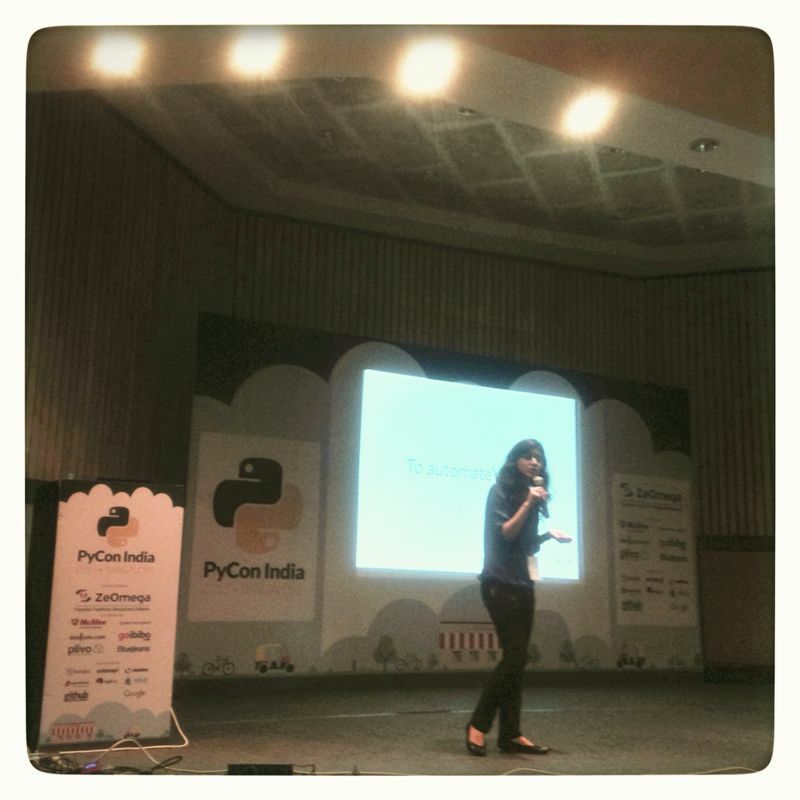 I attended PyCon India, Bangalore from 30 Aug,2013 to 1 Sep, 2013. It was my first time to PyCon and to Bangalore. I traveled to Bangalore an evening before the scheduled event. After landing at the airport, I was welcomed by the heavy traffic at Bangalore where it took me nearly 2 hours (more than the duration of my flight) to reach my venue for stay. The weather at Bangalore is similar to that of Pune, pleasant enough along with an addon ‘rain anytime!’. I was all set to attend PyCon the next morning. Day 1 at PyCon India was scheduled with workshops. I had to attend a workshop on “Functional Testing with Selenium” by Baiju M. scheduled at 13:00 hrs. I started off my day with breakfast at a South Indian Restaurant. I faced a little difficulty in communicating with the auto rickshaw drivers as most of them didn’t know either English or Hindi as a language (what they knew was to say proudly “only Kannada madam.. !!”). I did manage to reach Nimhans Convention Centre before the scheduled time for my workshop. Then was the time for registrations and meeting new people at the venue. Before the workshop commenced, I was introduced to Baiju M. by Kushal. It was a pleasure meeting the author of the documentation Selenium with Python that I have been following for use at my work. The workshop commenced with an introduction of the speaker followed by the introduction to Selenium. The documentation was distributed to each participant. Significant amount of time was absorbed by participants who did not do the required setup on their systems before coming for the workshop. It started with some basics about Selenium with Python. Baiju M. gave a demo how the selenium driver is capable of opening and closing a browser which appeared new to the students attending workshop. He proceeded with writing some test cases for the application under test and simultaneously explained the required steps. I primarily attended the workshop to listen to what Baiju had to say all about. As I was already working on the same, I managed to help out some of the students sitting around me at the workshop. In a nutshell, the workshop went really well. Day 2 onward, PyCon India included keynote, talks on numerous topics and had several side events in the open space. The event was well organised including registrations, food, talks, open space events and distribution of t-shirts. The schedule for all the talks was displayed on the board near Auditorium 1 and as a novice, I felt honored to be a speaker midst veterans. My talk was scheduled for Day 3 at 1400 hrs. There were two tracks running parallel in Auditorium 1 and Auditorium 2 . The day started off with the keynote speech by Kiran Jonnalagadda where he shared some of his personal experiences. Moving ahead, I attended the talk “logging on Steroids-How we mange logs at Inmobi” which was more about using logstash. Talk on “Package and distribute your Python Code” by Sanket Saurav was enlightening. Post lunch I attended the Panel discussion and spent most of the time in Open Space meeting new people and preparing a little for my talk the following day. Lightening talks was again a part of the day. Day 3 was kicked off by the keynote speech by Kenneth Reitz. I attended a part of the talk “Python in Raspberry Pi” and found it interesting. Then I got busy with some of the last minute preparations for my talk to be held post lunch at Auditorium 2. The food at lunch was good on all the three days. Now arrived the time when I was the speaker. I was happy to see a good number of audience for my talk. On a kick start interaction with the audience, I found a good 1:1 ratio of Testers: Developers in the audience. I started with an introduction to testing, the importance of testing and why should one do testing. How would a manual tester approach to test an application and why is the need to move to Test Automation? The test automation tool that I talked about was Selenium. I briefed a little about test automation with Selenium. My talk helped the audience build an approach to automated testing. The sample application for demo helped the audience understand and develop the skills to be able to start testing a web application. Then I explained structure of a selenium script to the audience that helped them understand some basics about Selenium with Python. I included code for some common test cases. The importance of generating test reports and how to generate test reports was included. A demo of test scripts running convinced the audience that Selenium really performs actions on a web application just like a human would do i.e. automation. I also talked about how should one maintain the test scripts and some of the best practices to be followed. Audience gave a very positive response. It seemed that the audience was overwhelmed to listen to what Selenium has to do with automating web applications. Some of them tweeted.. http://goo.gl/XWZaIx, http://goo.gl/o9IkkX, http://goo.gl/ShGMX8 , .. ! This was my first time to PyCon India and I had a good time socializing with people there. Also, happy to know that my talk was useful to people. I enjoyed not being a part of the audience for a duration of 45 minutes. The Q & A time after my talk was fully loaded with questions and people surrounded me with questions as I walked out of the auditorium. Alas! I did not have my business card for those who asked for it.. :D. One should make sure to carry their business cards when going to such conferences. Some of the places I visited in Bangalore.. Church Street, MG Road, Brigade Road, Lal Bagh and UB City(similar to DLF Emporio in Delhi). I enjoyed visiting the Silicon Valley of India. I simply loved the food I ate during my stay or may be my choice of food made me taste better 😛 The public transport at Bangalore is pretty good but the city sleeps early(@ 2300 hrs) !! Nicely done. This was really good. This is the fruit which I have got after giving water to a small little plant for the past years…. I hardly read blogs but this is good.